Ashley is a proud sponsor of FIRST (For Inspiration and Recognition of Science and Technology) Robotics and VEX Robotics in Western Wisconsin. Ashley Furniture recently announced that it is a proud sponsor of FIRST (For Inspiration and Recognition of Science and Technology) Robotics and VEX Robotics in Western Wisconsin. Recently, Ashley made multiple contributions totaling $45,000 to 26 participating school districts. Ashley has developed several partnerships with K-12 as well as post-secondary schools over the past five years. Combined efforts have included investing in STEM-based learning opportunities, scholarships, providing students with exposure to technical trades and career opportunities, instructor training, and robotics programs. As manufacturing continues to advance and the global economy evolves, training and educating our current and future workforce will be a crucial part of our country’s success. FIRST Robotics is volunteer-driven and encourages students to be leaders in science and technology while aiming to inspire young minds in the areas of STEM (science, technology, engineering and mathematics). With a $10,000 contribution and volunteer support from Ashley, a team of high school students from Arcadia, Blair-Taylor, Gale-Ettrick-Trempealeau, Independence and Whitehall school districts will learn how to design, build, program and test a robot that will then be used to compete against other schools throughout the state and country. The team, TC Robotics (Trempealeau County Robotics) is also required to operate the program as if they are running their own business where they will learn and apply concepts of marketing, financial literacy, fundraising and website development. 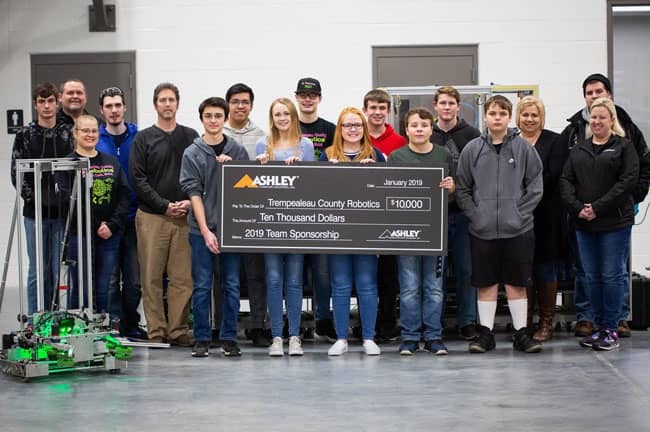 Ashley Furniture attended the 2019 FIRST Robotics Kickoff Event where an additional $10,000 was donated to the 7 Rivers Robotics Coalition (7RRC) to support nine other local FIRST Robotics teams. Included school districts were Caledonia, Holmen, Houston, La Crescent, La Crosse - Aquinas, Onalaska Luther, Onalaska, West Salem and Westby. Additionally, Ashley donated $25,000 to provide 16 middle schools with VEX Robotics equipment, eight of which started their program this year. The second-annual Greater Western Wisconsin VEX IQ Challenge was held at the Whitehall Memorial High School this past Saturday. Teams brought their robots to compete for a spot at the Wisconsin VEX IQ State Championship in Milwaukee. A second tournament will be held in February to accommodate the large number of schools participating. "This is a great activity for students as it incorporates academics, career readiness skills, collaboration with theirs peers and just having fun with their friends!” said Kristoff Ausderau, Whitehall Teacher and Tournament Director. “We are fortunate to have so many high quality dedicated educators in our region along with a generous sponsorship from Ashley Furniture to provide these great opportunities for students." Schools included in this donation are Alma, Alma Center, Arcadia, Arcadia Holy Family, Black River Falls, Blair-Taylor, Cochrane-Fountain City, Eau Claire St. Mark Lutheran, Eleva Strum, Gale-Ettrick-Trempealeau, Independence, Independence Saints Peter and Paul, Melrose-Mindoro, Mondovi, Osseo-Fairchild, Westby and Whitehall. More about Ashley Furniture: Ashley Furniture Industries, Inc. (Ashley) feels that every person deserves more value for their money. Established in 1945, Ashley is one of the largest manufacturers of home furnishings in the world, and was recently named one of America’s Best Employers by Forbes in 2017. From design through fulfillment, Ashley is committed to delivering the world’s best home furnishing values, selection and service, and earning the loyalty and trust of its customers every day. For more information, visit www.ashleyfurniture.com. About FIRST®: Accomplished inventor Dean Kamen founded FIRST® (For Inspiration and Recognition of Science and Technology) in 1989 to inspire an appreciation of science and technology in young people. Based in Manchester, N.H., FIRST designs accessible, innovative programs to build self-confidence, knowledge, and life skills while motivating young people to pursue opportunities in science, technology, and engineering. With support from over 200 of the Fortune 500 companies and more than $50 million in college scholarships, the not-for-profit organization hosts the FIRST® Robotics Competition for students in Grades 9-12; FIRST® Tech Challenge for Grades 7-12; FIRST®LEGO® League for Grades 4-8; and FIRST® LEGO® League Jr. for Grades K-4. Gracious Professionalism® is a way of doing things that encourages high-quality work, emphasizes the value of others, and respects individuals and the community. To learn more about FIRST, go to www.firstinspires.org. About VEX Robotics: VEX Robotics is a leading provider of educational and competitive robotics products to schools, universities and robotics teams around the world. Their VEX IQ and VEX EDR product lines span elementary, middle, and high schools with accessible, scalable, and affordable robotics solutions. Beyond science and engineering principles, a VEX Robotics project encourages teamwork, leadership and problem solving among groups. It allows educators to easily customize projects to meet the level of students' abilities as they inspire & prepare the STEM problem-solvers of tomorrow.